Like any good bureaucratic committee, they soon established sub-committees on sustainability, pollution, development, energy, forestry, water, biodiversity, endangered species, poverty, health, population and Agenda 21 (this item alone had 40 chapters each with its own sub-committee). Environmental conferences became the greatest multi-national growth industry in the world financed mainly by tax-payers via participating public servants, climate academics, employees of nationalised industries and tax-sheltered green “charities” such as Greenpeace and WWF. 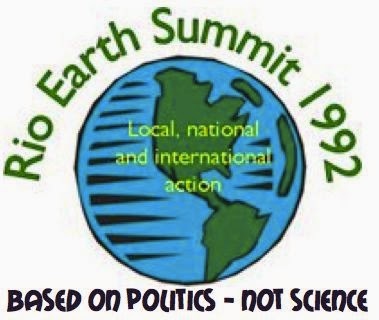 They really hit the Mother Lode with their creation of the “United Nations Framework Convention on Climate Change” which, in good bureaucratic tradition, duplicated the work of the “Intergovernmental Panel on Climate Change” (IPCC). These then created their own brand-names called “Global Warming”, and its proxies “Climate Change” and “Extreme Weather”. The Climate Conference Circuit became a bigger boost to airlines, hotels and fine dining than the Olympic Games and G20. Australia alone sent the PM plus a team of 114 to the failed Copenhagen Conference. Rich and poor all over the world have endured over 20 years of wasteful spending that could have built flood-proof infrastructure, drought-proof water supplies, erosion-proof beach fronts and pollution-free waterways. 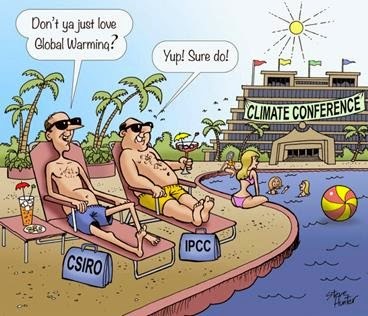 It has gone down the global warming gurgler without a single visible benefit for suffering tax payers. The above letter was published in the UK Daily Mail 2/9/14. I read your superb letter in the Daily Mail (UK) on Tuesday 2nd September 2014 and I would like to say that I and millions of others in this country agree with every word you said. The global warming fallacy must be the biggest con job foisted on the masses this century. I hope you will soon come to the UK to lecture before the idiots running this country pass a law banning criticism of the subject. The Carbon Sense Coalition today urged the federal government to stop wasting money sending plane-loads of people to pointless climate conferences, starting with the UN conference in New York on 23rd September 2014 and including the jaunt to Paris next year. The Chairman of “Carbon Sense”, Mr Viv Forbes said that 20 years of such conferences have achieved nothing useful for the environment or for the tax payers who fund them. “Already China, India and Germany have announced they will not attend in New York, and it is certain that Russia will give it a miss. Therefore no significant decisions will be taken, and no one from Australia should attend. “For the Paris climate party next year, Australia should send just one delegate with just one instruction: ‘Demand an independent audit of the science behind the failed climate models’. “Not one net payer of tax will be disadvantaged if all spending on this endless round of national and international climate conferences is stopped. Disclosure: Viv Forbes is a science graduate, geologist, mineral economist, farmer, Chairman of the Carbon Sense Coalition and has spent a lifetime studying climate, weather and the science of carbon. He has a vested interest in a small coal exploration company, in getting cheap and reliable electricity for industries and consumers and in protecting our natural grasslands and their soils and grazing animals. In the great Permian extinction, about 250 million years ago, about 95% of ocean dwellers and 70% of land dwellers disappeared. Many species of fish, corals, reptiles, insects and plants were eliminated. This was just one of five mass extinctions and there have also been over twenty smaller ones. Dinosaurs, which once dominated life on earth, disappeared as did mammoths and woolly rhinos. These were dramatic extinctions, but many species are disappearing quietly all the time - beaten by a changing environment, volcanism, meteor impacts, aggressive predators or competition for food and living space. Earth’s inhabitants and its climate are always changing. Even now, we live in an era of recurring ice ages where life ebbs and flows as the ice comes and goes. Probably over 95% of all species that have ever lived on earth are now extinct. It should not be surprising that many species now on earth are headed for the exit door. The natural world is not a still life, where even the most fragile and ill-adapted creature is guaranteed a permanent spot on the canvas. Earth’s biosphere is a moving picture and every era has its dominant actor. Other species spend varying times on the stage, and then most of them disappear. All species can be threatened by natural Earth changes. Humans are part of the natural world, and have survived so far because they have adapted to changing environments by using brains, hands, tools and natural resources. Preservationists think that the human species should exert herculean efforts to preserve every dying species. Attempting to preserve environments of the past, they lock up land, sea and mineral resources, prohibit development and oppose water conservation. And now, in a vain attempt to preserve the climate of the recent past, they are crippling our energy supplies with futile mandates and taxes designed to force-feed “green energy”. They should be free to engage in preservation activities at their own cost with their own property, but should not use governments to force our whole society down this risky road. Our access to abundant, efficient, reliable energy is all that stands between us and widespread famine. If the “temperature pause” turns into global cooling, with less carbon dioxide plant food in the atmosphere, this danger will be multiplied. We should not hasten our own demise with self-inflicted injuries.